Tonight we are going to review a very rare and unique wine, one that we were so eager to try for quite some time – R.A.W. 2016 by Crama Bauer. 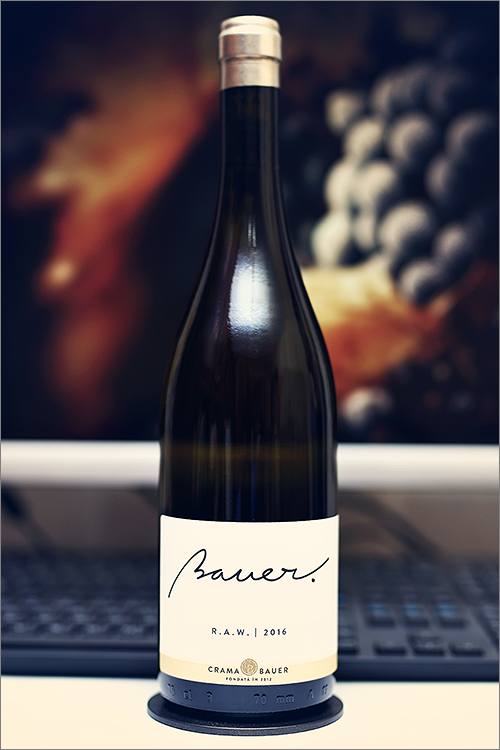 This is a single varietal sauvignon blanc wine that was made in a non-conventional, naturally-raw style, from old vine sauvignon blanc grapes, produced in a very limited edition, as only 600 bottles of this wine has been made. Human intervention in the winemaking of this wine was kept at the lowest possible level, thus resulting in an almost wild wine – the complete opposite of new-world and old-world styles, where wines are become more and more similar to each other and less unique. But let’s not get carried away by the theory side of things, therefore, without further ado, let’s move on to the tasting! Pale, pastel-yellow color with straw-white shades towards the rim of the glass. The nose is strong, filled mostly with herbal and citrus flavours: turf, fresh cut grass, hay, sour watermelon, lemon, kiwi, straw grass, sour apple, lemon zest, lemongrass, melissa, wormwood, arugula and some nuanced hints of apricot seeds. The wine is extra-dry, with high alcohol level, high acidity and green tannin. This is a quite herbal, zesty and angular wine, with a nuanced old-world profile profile. It tastes bitter, rough and green, with a tart yet noble accent towards the end of the plate. The wine feels robust and very mineral, yet it does display hints of elegance and complexity on the mouthfeel. It has a long finish and a balanced, velvety yet bitter-green aftertaste. This is definitely a fine Wine of Romania and the overall rating says the same, with 90.5 points scored it is right there, among the best wines we’ve tasted so far. Please click on the chart icon on the left in order to get to the wine rating page, where you can find all the wines we’ve tasted to date. Conclusion: this is definitely a genuine and wild sauvignon blanc wine – velvety-fine yet austere and angular – a wine that is still on the rise as it has not yet reached the summit of its form. We would suggest at least 12 more months of bottle ageing so that the wine will further develop and smoothen its rough edges, but don’t overdo it, as the wine has little to no additives, therefore is quite time-vulnerable. The wine has a green tannic grip on the mouthfeel, leading to a very complex and well structured palate, closing in on the finish with a quite bitter ending. We would suggest to pair this wine with sweet and sour dishes, like for example a pear salad with walnuts and gorgonzola or some grilled octopus slices with lemon and olive oil dressing. Cheers!